NLC job recruitment 2016 : neyveli lignite corporation limited (NLC) through GATE 2017 graduate executive trainee post.NLC india limited job vacancies 2016 apply online.NLC released job openings notification 2016 eligible candates apply online application through official websaite nlcindia .NLC syllabus,admit card,age limit,eligibility criteria,online registration processes,last date details given below check before applying. 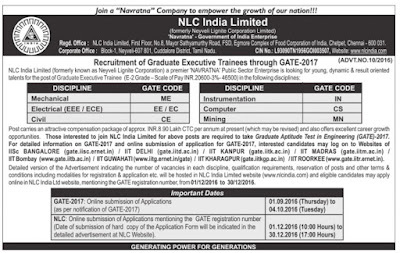 NLC India Limited (formerly known as Neyveli Lignite Corporation Limited) is looking for young, dynamic and result oriented talents for the post of Graduate Executive Trainee (GET) in the discipline of Mechanical, Electrical, Civil, Instrumentation, Computer and Mining through GATE-2017. The NLC India GET recruitment online registration start from 1st December 2016 and close on 30th December 2016. Candidates who have completed B.E\B.Tech from a recognized Govt. Institute\ University\ Board are Eligible to apply NLC job recruitment 2016.